One of the places that I have heard when I was growing up was Pagsanjan Falls. Imagine my surprise when I found out that Cavinti Falls is actually Pagsanjan Falls and that last weekend, I was given the chance to experience first hand the beauty of Cavinti Falls. However, as with anything worth getting to, we had to exert effort to actually experience the beauty of Cavinti Falls. We started with a trek to get to the place. 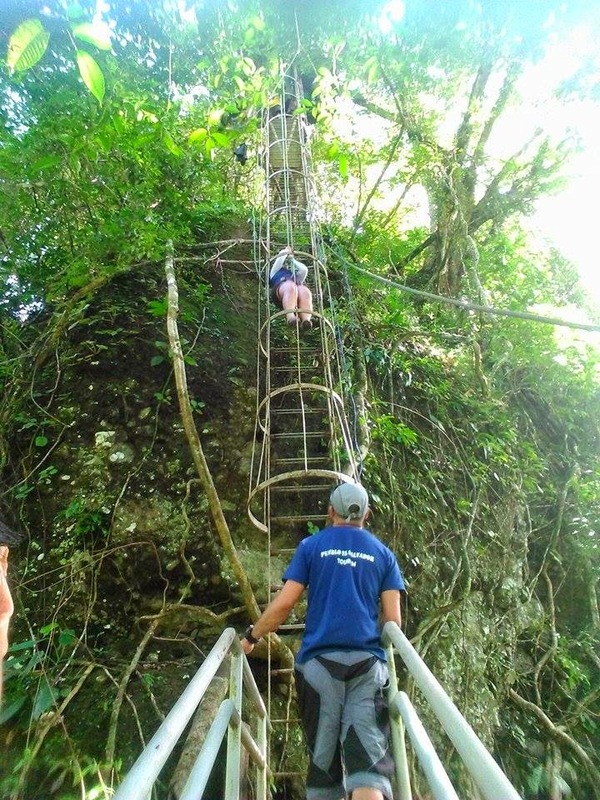 It took a bit of effort because I was never much for working out and this required trekking, overcoming 589 steps on a metal ladder that goes 85degrees, a lot of balancing and ensuring we don't slip on the moss growing all over, plus rappelling on tiny circular things. 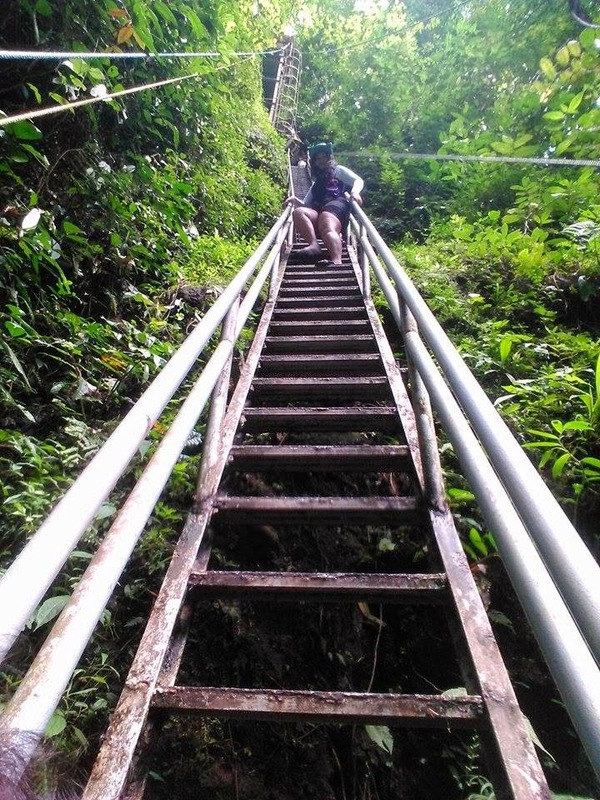 The stairs were one of the hardest because it was almost at a 90degree and its very scary to go down to since one misstep can actually lead you to your death. To be honest, I initially thought that there was no place that was worth all the hardship and effort we were giving into seeing this falls. As you can see, it wasn't easy getting into Cavinti Falls and it took a lot of strength, courage, determination, and screams of fear to get to the falls. When you do get to the falls, it is simply amazing. My jaw dropped and all I could say was that it was just gorgeous. It was unbelievable for a city girl like me to witness such beauty. I'm used to seeing skyscrapers, not magnificent waterfalls. It was just breathtaking. The water was icy cold. We had the opportunity to get inside the falls and it was just plain memorable. I've never been inside a cave, let a lone one under a waterfall. It was exhilarating. However because I am clumsy, I slipped and hurt my wrist which led to another adventure for myself and my friend, Dems. Normally when people trek towards Cavinti Falls, they need to trek back. Since I hurt myself, there was simply no way that I could lift myself up and so we had to take the boat. In a way, it was a lucky break (pun intended) because I got to see the other side of Cavinti and I just marveled at the beauty of the place. Virgin bodies of water surrounded us and I had to stop myself from screaming when the boat tilted a bit due to the rapids because it was just that kind of place. It was so serene that you don't want to disrupt the quiet. Cavinti Falls is definitely one of those places that are hidden in plain sight. Its located in Laguna and can be reached by land transportation yet many people are not aware that it even exists. Personally, I didn't know where it was or that it was actually right under my nose since I live in the South. What an awesome experience! I have to visit that place. Looks so fun! Those stairs are amazing and challenging. It looks like a great adventure. Wow, that looks like a great place for some hangouts with natural habitats. I would probably enjoy those icy cold water but I feel like the weather recently just makes me want to. Regardless of the weather I appreciate the recommendation for the place, looks nice! The trail is quite a challenge but it's really worth it because once you get to the falls, you'll be at complete awe! So glad you had the chance to go here and enjoy what the place has to offer. Amazing! Such a beautiful place to visit with my family! Wow, I want to go there and indulge in that falls! I love this place. I want to go to this place, such a wonderful work of nature! I super like your adventures here. Pagsanjan Falls has always been in my boys textbooks and even mine when inqas stillna student. I havent been there or i cant remember having beem there. wasnt even aware it has some hanging bridge rhere and i so love walking in hanging bridges. They give me that thrilling and somehow frightening effect. That looks so beautiful. I would love to check that place out sometime. I love the stairs. Those are pretty neat! I am so sorry that you hurt yourself. What an amazing place! I don't think I would have the strength to get myself up there though. Another trip to add to my bucket list. This looks like a wonderful place to have a family adventure! That looks like so much fun! I live in the city but there is a lot of water around at just a short distance that I regularly go up and get lost in it. There are so many pretty things to see when you get out there! wow! what an awesome adventure! I would love to go there. sorry you hurt yourself. That is such a beautiful place! Sounds like quite an adventure you had. The injury being the least exciting! But with time I'm sure it'll become a funny story because of it. Bucket listed the place for this coming summer. I can imagine the kids would enjoy their vacation here.